President Nicolás Maduro of Venezuela. 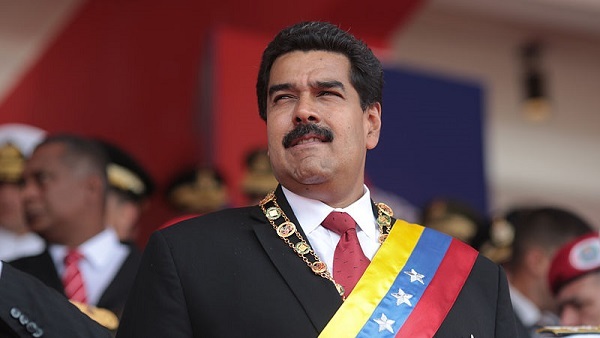 Venezuela – the once prosperous country that was the envy of South America – now confronts economic extinction as it faces the full impact of its failed socialist policies. With hardly any cash left in the country, the average monthly wage has sank below $3.00. Inflation was over 7% per day in 2017. Once enriched by its tremendous natural oil reserves, crude production fell by 29% last year, maybe the largest single-year decline by any oil-producing nation in modern history. And, this with no war, no strike, no cause, except for socialist policies come home to roost. In the last four years, the economy has shrunk by 40%. Twenty five percent of Venezuelan factories did not re-open after Christmas last year. Government price controls and economic regulations have emptied shelves of basic food & medical stuffs. Consequently, food is now rationed and you must have a government issued food card that is only given to those politically approved by the socialist regime. Consequently, hundreds of thousands are fleeing to neighboring countries. Some 1.2 million have migrated just in the last two years. That is just the tip of the iceberg though as a December 2017 poll revealed that 40% of Venezuelans want to leave their country. Venezuela thus becomes the latest poster child in the long line of countries driven to their knees after embracing socialist ideas and policies. So why, even as the historic evidence is consistent and accumulates, do Christians continue to advocate for socialism and, are drawn towards candidates that mouth the socialist line? One reason might be that Christianity and socialism seem similar in that they both appear to blame societal problems on the race for riches and place the cure on cooperation rather than competition. While it is true that some biblical texts would appear to berate the accumulation of wealth, upon close reading it is not the mere possession of wealth that is criticized. Instead it is the inappropriate method of getting wealth that comes from putting the love of money over the love of God that is condemned. If money is the top thing in one’s heart, then exploitation of others becomes acceptable in the pursuit of wealth. If God is number one in one’s heart, the act of creating new wealth is done in a God-honoring way that is respectful of people, and there is no stigma attached. But under socialism, the top priority is equality of economic outcome – an obvious violation of the 10th commandant. With equality being top dog in the socialist heart, communal political theft then becomes justified, in blatant violation of the eighth commandment. Socialism is an ‘ism’ based on fear and timidity: In order to make sure that there is no ‘bad’ social inequality it takes away from the individual the opportunity to gain wealth beyond the norm, thus denying future good for all. When it comes to the second apparent similarity, cooperation, Christianity does indeed emphasize cooperation among believers, a cooperation based on the guidance of a shared faith and under the direction of the Holy Spirit. Unfortunately, the cooperation envisioned by socialism is one based on directives from the human elite orchestrating their subjects’ behavior – a coerced ‘cooperation’. Socialism didn’t force itself on the Venezuelan people. No, they voted for it in their 1998 election, electing Hugo Chavez by 56% popular vote. He appealed to the people’s envy, advocating stealing property from the ‘rich’ and giving it to the ‘poor’. It took twenty years and now there are no rich left…except for those in government…who in the end turn out to have stolen from both the poor and the rich leaving nothing but tragic poverty in their wake. Not an exceptional socialist story.